The New York Mets had the lead in the 9th inning of yesterday's home opener against the Washington Nationals. Closer Bobby Parnell came in for the save, his first appearance since July 30th of last season, and ended up blowing the save. 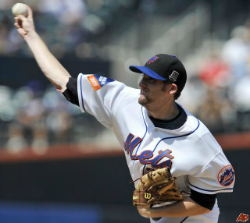 Today the Mets announced Parnell has a partial tear in his elbow and will be shut down for 2 weeks, minimum. Parnell's first pitch was 89 MPH and right away, the Mets broadcast booth noted that that is a terrible sign, considering Bobby throws heat. Parnell's season ended last year with a herniated disc in his neck. It would seem as though Jose Valverde would get first dibs at closing games for the Metropolitans.